I spent some time wandering through the menu on my Nikon D300 the other morning, and came across a feature I had missed or forgotten about when first exploring the camera. This camera and the control UI continue to impress me. 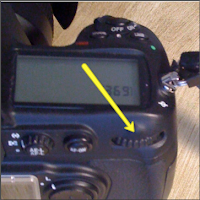 On the Nikon D50 (and many others) there is only a thumb dial on the back of the camera. Depending on whether you're in S or A mode, it controls the shutter speed or the aperture. The D300, on the other hand, has both a thumb dial on the back of the camera and a finger dial on the front. 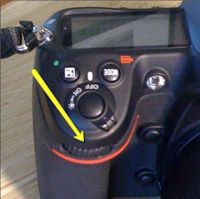 When in Manual (M) mode, the thumb dial controls the shutter speed and the finger dial controls the aperture. This makes sense; both controls are exposed. The little bit of genius that seems so obvious is that the assignment of shutter speed and aperture to each dial is consistent - when in A mode, the finger dial still controls the aperture (and the thumb dial does nothing) while in S mode the thumb dial controls the shutter speed (and the finger dial does nothing). This allows you to form a tight mental mapping of thumb=shutter, finger=aperture, and if you happen to be in the wrong mode, the wrong dial just won't work, providing additional feedback about the state of the camera. Genius. Enter the Custom Settings Menu item b4: "Easy Exposure Compensation". When you turn b4 to On or On (Auto Reset), it enables the other control in S and A modes. When in S mode, the thumb dial still controls the shutter speed, and if you change it the camera will automatically change the aperture in order to maintain correct exposure. However, if you adjust the aperture manually (still with the finger dial), it will have the same effect as the exposure compensation button - adjusting the aperture to under or over expose the picture. Even though you are in S or A mode, you are always able to control both the shutter speed and the aperture! If you adjust the 'right' one (shutter speed in S, aperture in A) it will keep the exposure level correct. If you adjust the other one (aperture in S, shutter in A), it will adjust the exposure under or over. Setting b4 to On has exactly the same effect as using the exposure compensation button. Using the On (Auto Reset) has one additional benefit - when you turn off the camera the exposure adjustment resets to normal. I have my camera set to On (Auto Reset). I am in love with how this makes the process of getting your exposure just right that much easier. Turn off the camera and everything resets so your next picture isn't under exposed. BEN- Thanks for your info on the Auto Easy Exposure Compensation I could not find in The D300 instruction Manual what exactly it did but finding some one who actually write up about the subject I sat with this information at My Computer and now its quite clear. ( I should kick Myself after owning mine for about 10 years but it dawn on me until you explained it. I think Nikon has thought out The D 300 with some very innovative/practical menus and put some serious thought into designing a pro DX DSLR although nearly 10 years old it pauses to thought is it worth buying The D 500 when older technology has enough controls and menus. The Nikon 300 seems to be a ageless design which I believe cant be improved I am saying that from a conventional approach to consistent technology of which there is just too much of are we at a stage of gimmickry too sell the latest models.